Fresh Fish on the Barb-b, Finally!!! 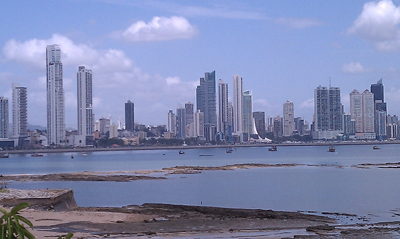 We left Panama City a day later than planned due to the need to get about everything we need for the next six months. This may be a slight exaggeration but we have been cautioned that the next time we might see a real grocery store, hardware store or liquor store will be when we hit Australia. If we do find these stores in French Polynesia they will be quite expensive. So we have been stocking up on so much I am again reminded about how difficult it is to store everything on the boat. When we arrived at the anchorage today after a five hour sail (we actually motored and had not wind for the first time in quite a while), there were only two other boats there. By the time the sun was setting there were only two. The other boat flew a French flag and as I settled in to make dinner, two French men from the boat came motoring up in their dinghy offering us fish. They had gone spear fishing and had more than they could eat. They wanted nothing for the fish and seem pleased that we were grateful to have it. 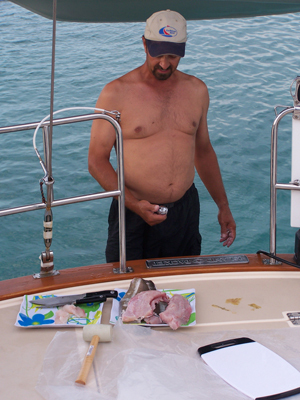 As Mark took the two fish aboard he was surprised that they were still wiggling around. One of the men said, "Yes, very fresh fish." Once they left we took out our meager fishing supplies and I went and got the book titled Salt Water Fishing Made Easy. I began to read the book as Mark followed my directions. Every once in a while I would get engrossed in the book (which was infinitely more pleasant than what Mark was doing). Mark would say keep reading, aloud please. Mark was a trouper and within an half an hour "we" had filleted the fish. The larger fish was huge and we decided that we would freeze 75% of it and eat the rest for dinner. The dinner I was going to make transformed itself into a fisherman's stew with the meat from the smaller fish. A portion of the larger fish was wrapped in foil and cooked on the barb-b. As we ate the fish that was absolutely delicious, we could only think how much better it would have been if we had caught it ourselves. It's only a matter time! We leave for the Galapagos Islands at noon on Thursday. We will be crossing the Equator and will be making an offering to Neptune as sailing tradition dictates. We have to decide what is worth throwing overboard. I think Janet might want to pick me for the offering. I should be on my best behavior for the next few days. It will be a 6 day trip and we will be motoring most of the way through an area known as the "Doldrums". The winds are 0-5 knots and variable so sailing will be difficult. We have enough fuel to motor about 900 miles at 6 knots. That is about the distance of the trip. So fuel conservation will be important and we may be bobbing around waiting for the wind. Wish us luck. Andrea and I got up bright and early the morning after the transit to take a tour of the Emberer Indian Village in Panama. Mark was more than happy to stay on the boat and relax (fix broken things). The Emberer Indians originally lived in Darien, South America but many left that area to resettle along the Chagres River due to the abundance of fish in the river. Although the area was later converted into a National Park after some negotiations, the Emberer Indians were allowed to remain living in the Park. Under this agreement, they were no longer allowed to sell the fish they caught but rather developed their economy around tourism. We were invited to their village for lunch and they entertained us with several of their traditional dances. We also had the opportunity to dance with them. Like the Kuna Indians they sold their crafts and also were willing to give us temporary tattoos. Andrea and I enjoyed the day greatly. We were taken for a canoe ride up the Chagres river in a hallowed out wooden canoe (they did have gas motors). We hiked to a waterfall for a swim. Then toured their village and ate fresh fruit, tilapia and plantains for lunch. The food was delicious, yes, even the fish. We danced with the Indians (I was picked first to go onto the dance floor!) Andrea and I were given temporary tattoos (hopefully) for $2. And then we bought some crafts from the Indians. Several of the Indians spoke English and we had a translator who was our tour guide. Thus, we were able to learn a great deal about their lives. Unlike the Kuna Indians, their huts were high off the ground due to the snakes and the jaguars. We also learned quite a bit about how they elect a chief every five years and how they use medicine men for both spiritual and physical healing. Their religion is based on nature respecting the resources around them. The photos of our visit to the Emberer Indians have been posted to the gallery. The next day Mark, Andrea and I went on a tour of Panama City. The view of the city from our marina is quite impressive. It looks like a typical American city with many high rise buildings. Daniel was our tour guide again today and he did a fantastic job. No matter what question you asked him, he was able to answer with specific dates and the names of all the leaders involved, both Panamanian and American. He educated us about the longstanding relationship between the United States and Panama. He was grateful to the United States for all they had done to help them gain independence from Columbia and also for giving over the operation of the Panama Canal to Panama in 1999. The transfer of the operation of the Panama Canal to Panama was agreed upon in the Torrijos-Carter (the President) Treaty originally signed in 1977. The talks to transfer the operation of the Panama Canal to Panama began in the early 1950's. Yes, it took quite a while. There is much cultural diversity in Panama given that over 75,000 workers were brought to Panama from all over the world to build the canal. Many of these people stayed in Panama and thus the great diversity. The predominant language is Spanish and Mark tried valiantly to speak as much as he could. More people spoke English than we expected so we were able to get around in taxis to do grocery shopping, etc. Approximately 80% of the population is Catholic but many other religions are represented. There were many sailboats that have remained anchored in this area for many years. The cost of living here is very reasonable and everyone is very friendly (even if you cannot speak their language). 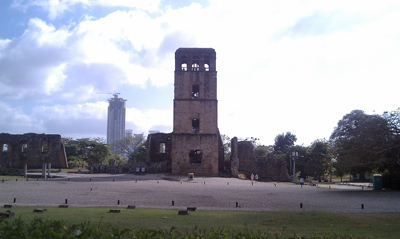 Check out the photos in the gallery of Panama City showing its diverse architecture. We sail 50 miles to the islands of Las Perlas tomorrow (Friday February 3, 2012) after much time has been spent shopping, restocking, fixing, cleaning, blogging, emailing, etc. I was finally able to do my own laundry at the marina for only $1 per wash and $1 per dry. Total cost - $14 compared to $100 in the Caribbean. I also have a plethora of fresh fruits and vegetables on board now. It is amazing what thrills me in our new life on board our boat. We leave the Las Perlas Islands on February 9th for 6 day trip to the Galapagos. The availability of the internet to stay in communication with friends and family using Skype and email is only going to be more limited over the next 6 months as we sail through the Polynesian Islands. But Mark will do his best to seek out those hot spots to keep the blog updated. Thanks for all the comments and emails. It is hard to describe but let me just say that it really makes us very happy to see so many of you connecting with us on this experience and expressing your support. We will update the blog again before leaving for the Galapagos. The trip through the Panama Canal was spectacular. I will attempt to describe the crossing but I cannot imagine doing it justice. On Thursday, January 26th we left the Shelter Bay Marina at 3:00 pm to anchor just outside of the entrance to the first lock of the Panama Canal. With Andrea's help, we had finished our "to do" lists and were feeling good about the condition of the boat for the transit. In the anchorage, we were joined by ten other World ARC boats that would be making the transit with us. While we were waiting for our advisors to be dropped off at our boats, we prepared fenders and lines necessary to keep from hitting the canal walls. Each boat has a Panama Canal employee on the boat as they go through the canal. You are to provide your advisor with a hot meal and bottled water during the trip. Our advisors were late getting on boat which meant that we would be going through the first set of locks well into the night. Francisco, our advisor, was dropped off by a pilot boat at 7:30 pm. We quickly picked up anchor to head to the first set three locks called Gatun Locks. 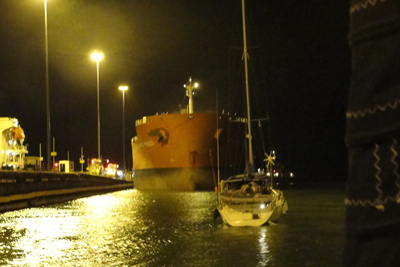 At night, with cargo ships moving all around us, we made our way to entrance of the first lock. And there we sat for over an hour. Once we were approved to go through, we rafted our boat (tied together) to Southern Cross and on the other side of Southern Cross was Glamorous Galah (Ausie, Ausie, Ausie). We rafted together while we were underway using our engine which was quite a feat. Mind you that Mark and I have never rafted our boat to another boat, never mind rafting it while underway. Once tied together we proceeded as a group to the first lock. The other three rafts were ahead of us. Appropriately, At Last brought up the rear. Once inside the lock, the line handlers on top of the lock walls, threw two long lines with a monkey fist (a type of knot) to the two boats on the outside of the rafting (At Last and Glamorous Galah). The monkey fist is a bit heavy and makes a clunking sound when it hits the deck. We had the monkey fists thrown onto our bow for fear of them hitting our solar panels which we were warned could break if a monkey fist hit them. We had to protect the panels by lashing our folding padded chairs to them. Once the lines were on the boat, we tied them to 200 foot heavy ¾ inch blue lines already on the boat. Once tied, we fed the blue lines back to the line handlers on the lock walls. These lines were then put around cleats on the shore of the canal and were tightened to our boat by Mark and another crew from Southern Cross, Dave, who was at the bow of the boat. Then the huge walls closed and the lock began to fill with water for about 30 minutes. During this time, Mark and Dave were taking in the slack on the lines to the boat as the water rose. This is the hardest job of all because the pressure and turbulence caused by the water entering the lock it difficult to take in the slack of the line. This was the biggest surprise of the experience for Mark. He thought the line handlers were the one who would be pulling on the lines keeping the boats in the middle of the canal. His shoulders and hands got a workout. I was at the helm working with the other two boats to keep our boats steady with the wind blowing and from the current created by the water entering the lock. (Janet was at the helm steering the boat for the entire transit of all the locks -- what a sailor. Ricardo respected her abilities very much and it was evident). Everyone else was busy taking pictures and drinking coffee! Once the water filled the lock, the walls opened and the line handlers on the lock walls walked our boat to the next lock. At this point the heavy blue lines are back on the boat but remain connected to the boat by the line with the monkey fist. What is moving the boat through the lock at this point is not the lines held by the canal workers but our engines as we motor as a rafted group to the next lock. Motoring through takes a coordinated effort from the three boats and the advisor on the middle boat, Ricardo, gave instructions to the three people at the helm on how to motor through without hitting the walls. Ricardo was excellent and there were no close calls. We did see the rafted group in front of us get within two feet of the wall as the wind and current were overtaking them. Close call! Once through the first three locks which were all connected, we had to un-raft in the last lock because there was a cargo ship entering the end of the lock and we had to sneak by it on our way out, single file. Each lock is 110 feet wide by 1,000 feet long so there was room but sharing 110 feet with a huge cargo ship is not ideal. What is worse is that once you pass the ship the wake from his engine is enough to send you into a tail spin. Francisco, our advisor, told me to "give it all you got" as I passed the cargo ship, which I did but still the boat had difficulty with the cargo ship's wake. Once through that ordeal, it was about 1:30 am, we needed to anchor, have our advisor picked up and get some sleep before we started at 7:00 am the next morning with the second set of locks. Needless to say, each of us got about four hours of sleep. Robin, our advisor for the second day, boarded our boat promptly at 7:00 am. We served him coffee and a hot breakfast (thank you Andrea!). We then motored the next four hours through Gatun Lake to the next set of locks. We motored along and then added a sail to gain some speed. The entire time we were motoring Robin was getting updates on when we would be entering the second set of locks. Sometimes Robin would get off the phone and say speed it up, as we got closer it was slow down, there was a delay. At around noon we got to the entrance to the second set of locks and we again rafted with Southern Cross and Glamorous Galah. Then we began to wait. Ricardo, the advisor on Southern Cross, suggested we anchor while waiting which we did. Southern Cross threw out their anchor and it held all three of us in place. Then we fixed lunch, Southern Cross popped some popcorn and we gave each other tours of our boats. We were the only group that anchored while waiting and we were grateful to relax for a bit. The second set of locks were a bit easier because we were being lowered toward the Pacific Ocean. When lowering the water level, there is much less current so Mark and Dave had less pressure on the lines. There was quite a bit of wind though so we did use the engine motors to keep the boats in place. Doing this in daylight also was easier. It took a bit longer to get through these locks because they are not all connected. You go through Pedro Miguel lock then motor through Miraflores Lake and then enter the last two locks which are connected, Miraflores locks. The excitement in the last set of locks was clearly the web cam which we waved at enthusiastically! Ricardo called his friend who was the operator of the web cam and had him zoom in on us on At Last but that was just before we departed the locks. We don't know if anyone saw the close-up of us on the cam. We broke the raft soon after leaving the lock and had an hour trip to La Playita Marina where we are staying for the next few days. Along the way we dropped off Robin, our advisor, onto the Pilot boat while underway. The pilot boat driver had to make 5 attempts before Robin could jump to the Pilot boat. Each time the boat came within inches of taking out our life lines. Take a look at the photo gallery for a shot of Robin jumping onto the boat when we are doing 5 knots in 25 knot winds in the Panama Canal shipping channel. The best of rest of the 600 photos taken during the transit are posted to the Gallery. Mark, Andrea and I all agreed that the trip through the canal was truly spectacular. Here are some interesting tidbits we learned about the Panama Canal. The canal opened to traffic on August 15, 1914 and they have worked flawlessly since that time. The overall technology of the locks has not changed. We also learned that they do not use any pumps to move the water in and out of the locks. They are gravity fed from the Gatun Lake at the rate of 26.7 million gallons per lock for a sail boat, less water for a 900 ft cargo ship. The doors of the locks weigh 800 tons each and they do not leak when closed. They are currently building another set of locks to accommodate even larger cargo ships. The cost of the new construction is 5.25 billion dollars (Big Dig and a half) and it will be completed in 2014 (doubtful). Large cargo ships can pay up to $400,000 to go through the Panama Canal while small sailboats pay about $500. On average approximately 36 ships transit the Canal every day and the canal runs 24/7. Mark Mathews posted this article on Sailnet in 2003. He did a good job of describing the canal and the experience. 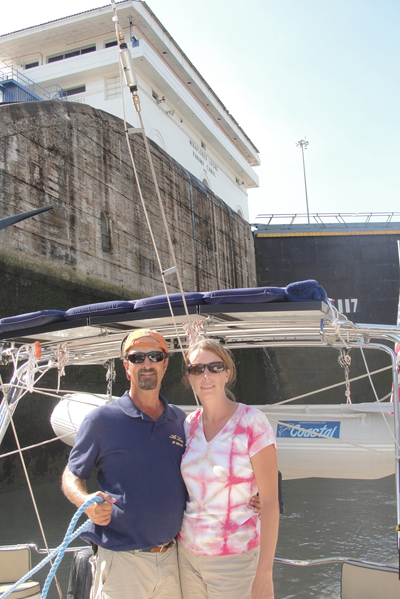 Click on this link to read more from the Sailnet Article on transiting the Canal. One final comment about the World Cruising Club staff and their management of the transit - they have done a remarkable job!! Everything was well planned and organized in a place that tries its best to defeat any efforts of planning and organization. I would not want to attempt this transit without their knowledge, local connections, and experience. It was not a piece of cake, but it would be very difficult without their competent assistance. Thank you World Cruising Club staff for making this an enjoyable and memorable experience!! As many of you who watched in real-time know, we completed the transit of the canal around 3:00 pm on Friday January 27th. We have to say that was an amazing experience. It will be hard to find the words to adequately describe this part of our adventure. Now that we found a wifi hot site, we will be responding to the many emails and comments very soon. It was great to see so many of you watching us go through the canal. Andrea's daughter Jessica was texting her with pictures as we were on the web cam. I will have to review the 500 photos we took to select the best of the trip. Thanks to Andrea for serving as our photographer among many other responsibilities she performed so well. We will update the blog in a couple of days. We are waiting for our turn to enter Miraflores Locks in the Panama Canal. We are next in line after the large cargo ship. ETA 1:45 give or take. The pictures from our stops in Richard's Bay, Durban, St. Francis and Cape Town. Here are photos of the passage to Panama, the San Blas Islands, the transit through the canal and events yet to come. These are pictures from the last of the Leeward Islands. Photos of Terre-De-Haut, an island part of Les Saintes southeast of Guadeloupe. Here are some photos of the islands as we were leaving Nevis, passing Montserrat and arriving at Antigua. A pleasant 50 mile motor sail into 10 knot head winds. I took a nap for 90 minutes. Blogging keeps me up late at night. These were taken last year sailing in Long Island Sound by Yacht-Shots. My colleagues at Baystate Health were kind enough to have three copies of one these photos printed and framed for me as a going away gift. A large one for home, one for the boat and one for my desk. Very Special! This is a compilation of photos taken over the first four years of cruising on At Last in Naragansett Bay and Long Island Sound with close friends, family and the Cruising Club of New England, a wonderful group of sailors.